Painting hasn’t gone quite as quickly as I hoped this past week. Partly because I spent some free time actually playing my first couple of 8th edition games. As such, I didn’t have as much time for painting. 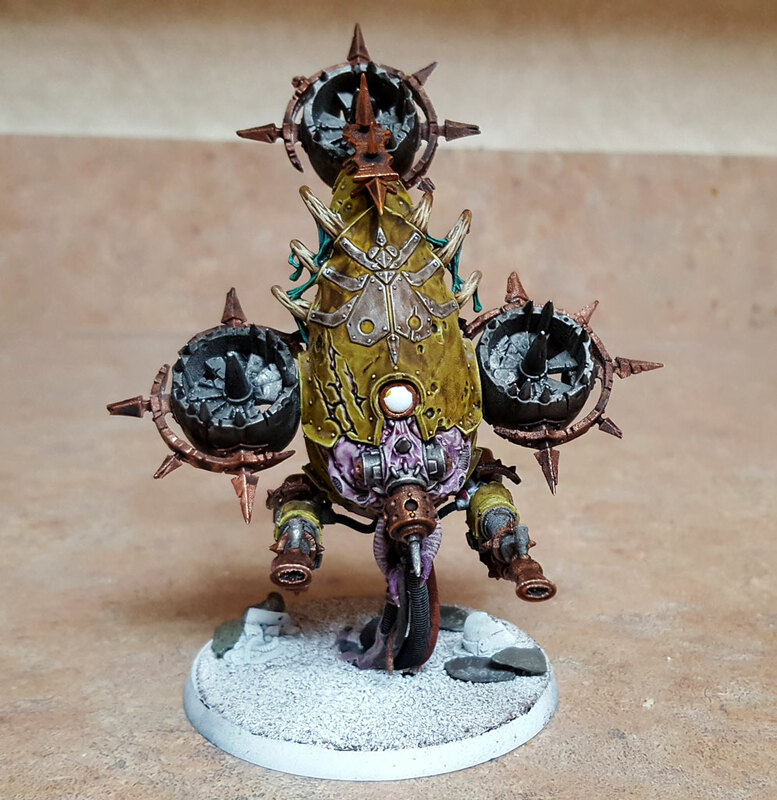 But I did get some work done on the Foetid Bloat-drone for my Death Guard. I finished the base coats and the shading. I’m about 75 percent done with the highlights. I picked up a pot of Ogryn Camo the other day, and I think it’s a great highlight for the Vallejo Camouflage Green. On the “antlers” I went over the Zandri Dust with Ushabti Bone and then Screaming Skull. For the ichor coming off the antlers, I layered Incubi Darkness, Kabalite Green, and Sybarite Green. 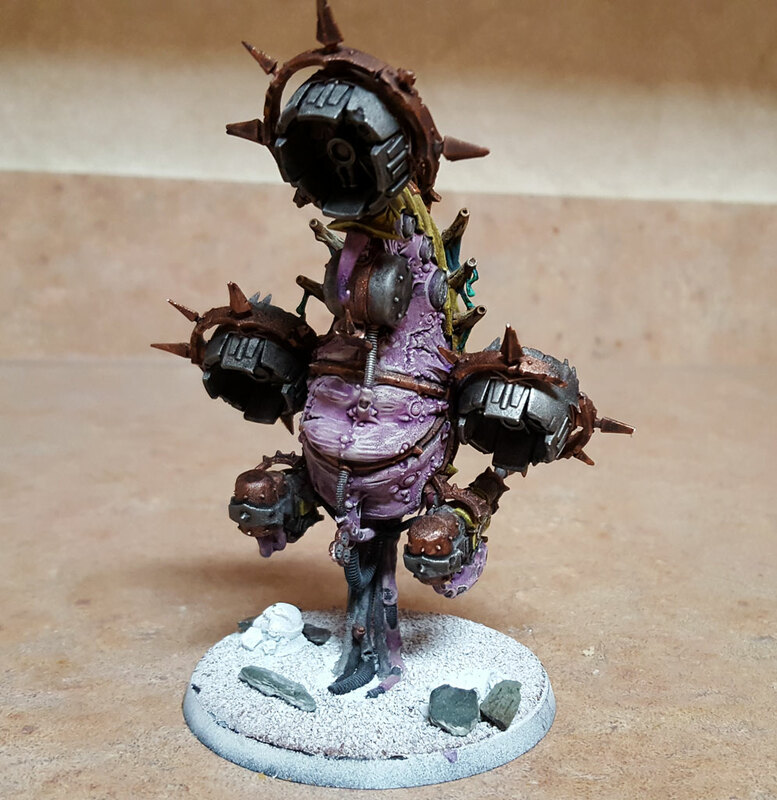 For the flesh, I used a base coat of Rakarth Flesh, then shaded the flesh with Druchii Violet. 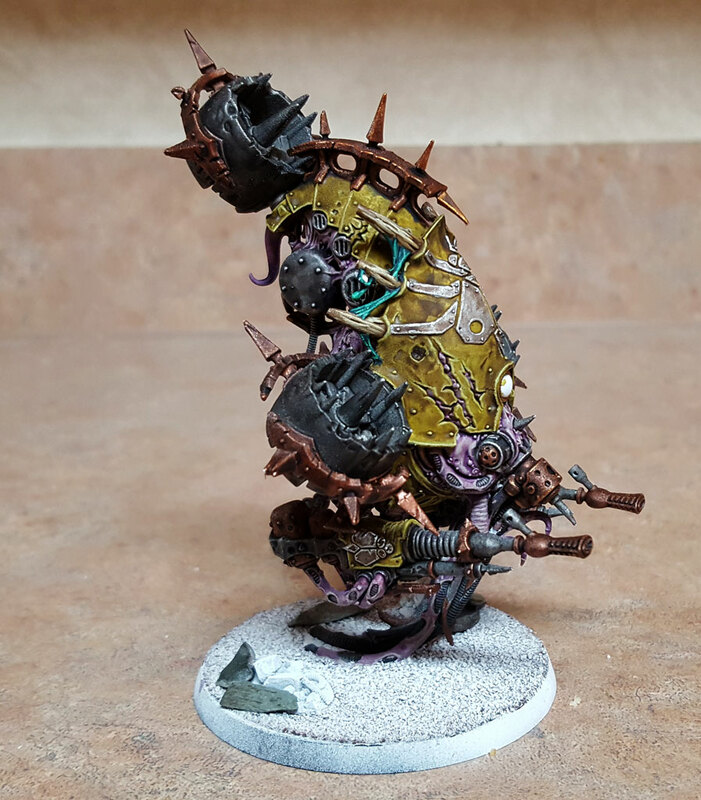 I then went back over most of the flesh areas again with Rakarth Flesh. I’ll finish that up with some Pallid Wych Flesh. It seems every time I try to start a loyalist Space Marine army, I end up getting sucked back into the Warp after I finish the first squad. 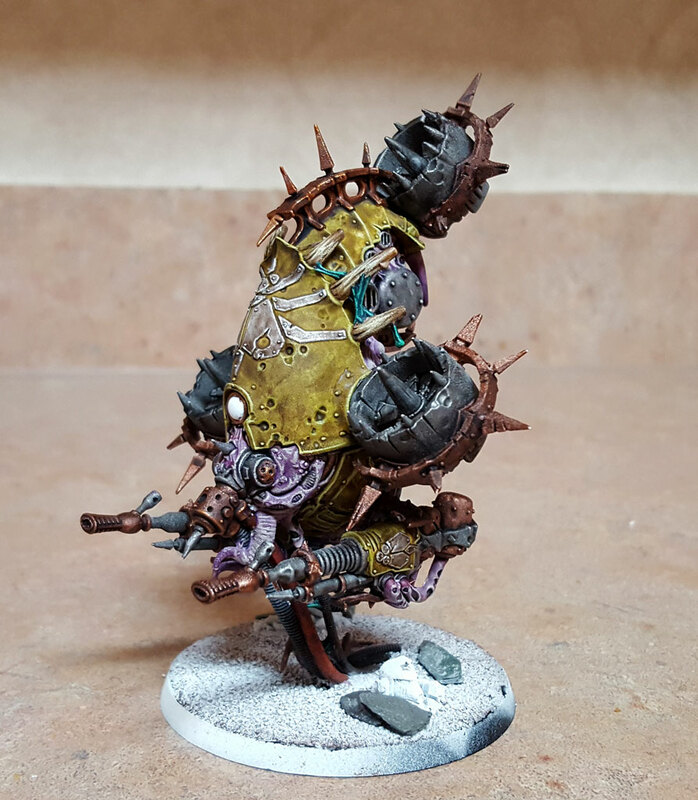 With the new models for Death Guard in the house, I couldn’t help myself. So the Dark Angels are back on the shelf. Just for the moment, I hope. 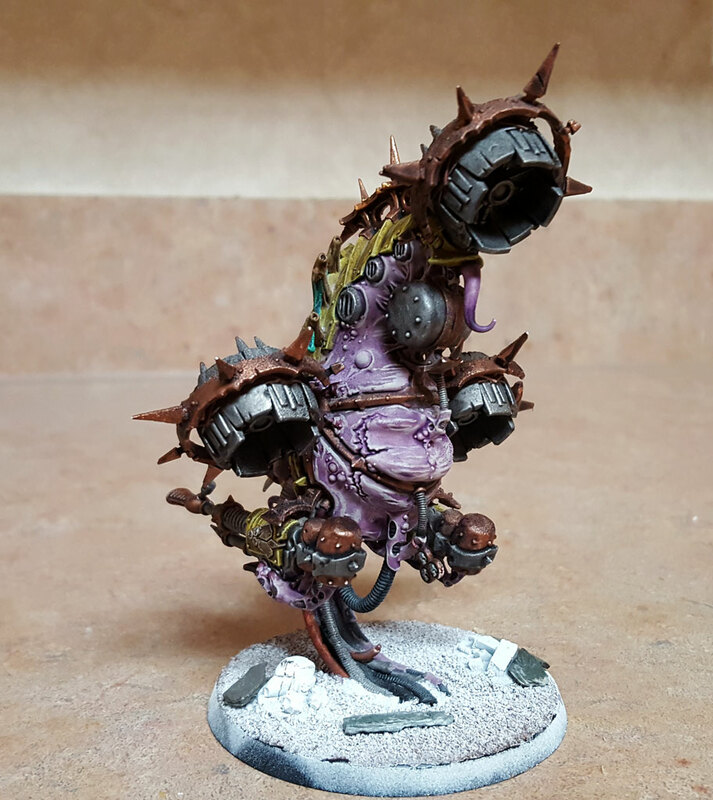 Right now, I’m painting the Foetid Bloat-drone and the squad of Plague Marines. Adding those units to my current Death Guard army will put it in the neighborhood of 2000 points. That’s what I want to have ready for the upcoming world-wide campaign. 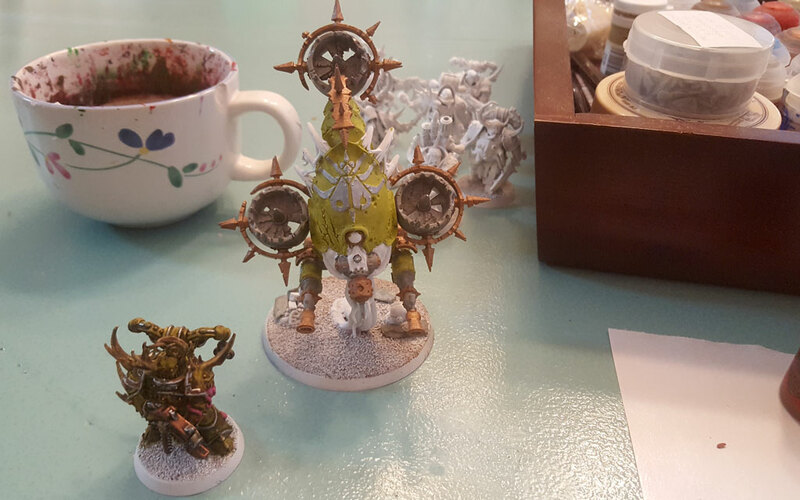 With a little bit of luck, I’ll be finished painting these models by the campaign’s start date. It’s been a couple weeks. 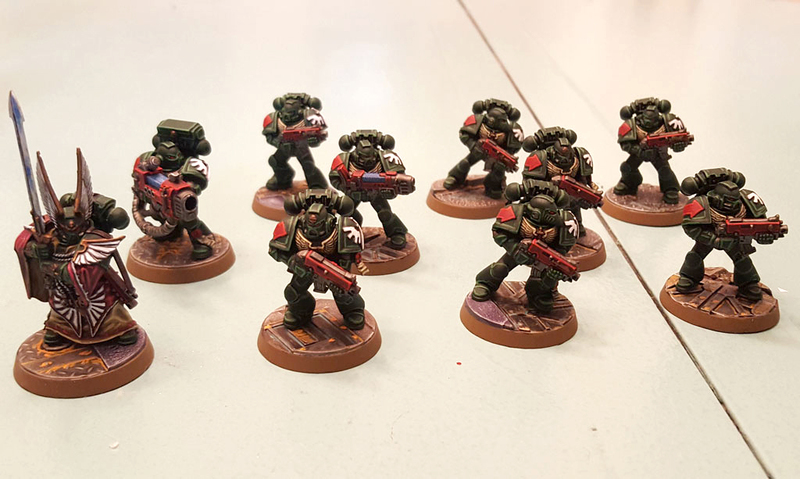 I’ve kept my Dark Angels moving through the painting process and now I have a full group of them painted, as well as the company commander. Well, I am missing the appropriate sergeant, but more on him later. As it stands, I have nine Dark Angels done and the company commander. I was able to get the proper paint color for doing the highlighting. I still ended up with a Tron-like effect, but it’s much more muted. One thing I need to work on is the edge highlighting technique. The lines on these minis are a bit inconsistent in the width. I think I’m also going to scale back the number of edges I highlight from “darn near everything” to a more reasonable level. Looking back over the minis and thinking about it, probably not every line I did needed to have a highlight. Still, it looks pretty good from a table-top eye view – as in the distance your eye normally would be over them minis if you were playing a game.